The Gearbox International Foundation was founded in 2017 to support hardware entrepreneurship ecosystems that serve the needs of the poor worldwide, but our story goes back to the growth of the software community in Kenya starting in 2007. During the 2007-08 election crisis, a group of bloggers built a tool called Ushahidi to help Kenyans communicate, map, and avoid areas of violence. Their efforts drew the attention of the international community, and over the next ten years, they turned Ushahidi into a nonprofit software development company building crisis management tools that have been adopted by the United Nations and used in more than 160 countries. As one of the first movers in the Kenyan tech ecosystem, supporting new initiatives to help Kenyans build technology that meets their own needs is a core part of their mission. Ushahidi has played a central role in building the wider Kenyan tech ecosystem, including Gearbox, from day one. At the same time that Ushahidi was taking off, some of the same bloggers were highlighting the creativity and ingenuity on display across Africa's diverse communities of artists, artisans, inventors, manufacturers, tinkerers, hackers, designers, and engineers on a blog called Afrigadget, a catalogue of homegrown hardware innovations ranging from bicycle powered compost tumblers to a urine powered electricity generator. They gathered at the first continent-wide Maker Faire in Accra, Ghana, in 2009. The second Maker Faire Africa happened in Nairobi, Kenya, in 2010, hosted at the University of Nairobi Fab Lab by many of the same people who would go on to launch Gearbox. Maker Faire Africa was held yearly from 2009 to 2014 in Accra, Nairobi, Cairo, Lagos, and Johannesburg. By 2010, the team at Ushahidi had grown too big to keep working out of coffee shops. Knowing that many of Kenya’s other tech enthusiasts lacked a dedicated space to meet like-minded individuals and find reliable internet, they built the iHub to help grow the Kenyan tech community. Starting life as a coworking and events space, the iHub grew to have its own team and host numerous competitions, accelerators, and tech startups. Growing alongside its community, iHub 2.0 launched in a new facility in 2017, offering private workspaces and a suite of services to Nairobi’s more mature startup ecosystem. Back in 2010, the team at Ushahidi found reliable internet access was still a problem even at the iHub. Their solution was the BRCK, a battery-powered, ruggedized modem and router with multiple failovers designed to provide uninterrupted internet access in low-infrastructure environments. BRCK spun out as a standalone hardware company in 2013, building rugged communications technologies for individuals, educational institutions, and industry. Now with almost 50 employees, the BRCK team are working to provide free public wifi, anywhere in Africa. 2012: Gearbox - "Shop in a Box"
At the same time that the iHub and BRCK were taking off, entrepreneurial activity at the University of Nairobi’s engineering department was picking up pace. 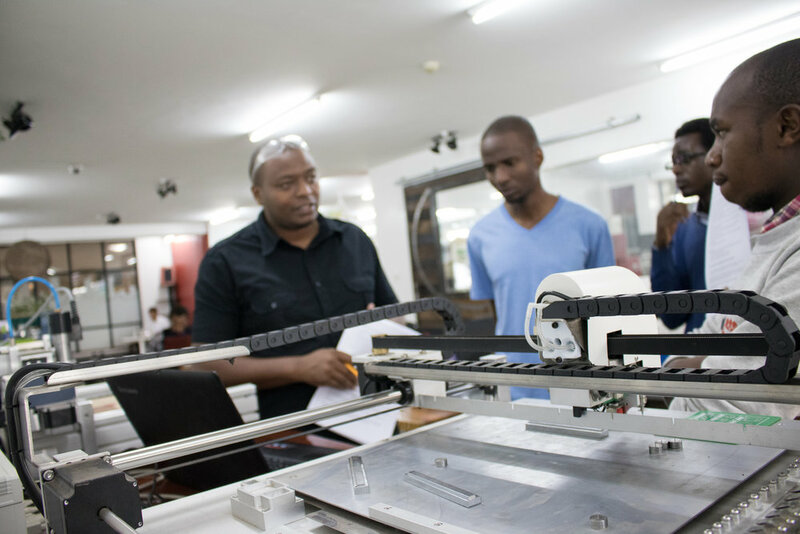 The UoN Fab Lab was launched in 2009 to give students exposure to digital fabrication tools, and hosted Maker Faire Africa in 2010. By then, the UoN Science and Technology Park hosted 15 student and faculty led companies. The iHub Robotics Club and the Fab Lab collaborated frequently, so when a shipping container full of tools (including a CNC plasma cutter) was donated to the iHub in 2012, the two organization’s teamed up to launch Gearbox – Nairobi’s first makerspace. Gearbox spent its first two years as a website, a shipping container full of basic metal working tools, and an enthusiastic community of tinkerers. When the founding team at BRCK met the team at Sanergy, a social enterprise building “waste to energy” and sanitation solutions for Nairobi’s informal settlements, they both lamented the difficulty in designing and prototyping hardware in Kenya. Sanergy found it faster and cheaper to prototype their toilets at a makerspace in Seattle, Washington, and ship them to Nairobi than to build in-country. BRCK developed their products primarily in Kenya, but this added one to two years to their development process. Both companies were considering investing in prototyping facilities. True to form, rather than each invest separately in building private capacity, BRCK, Sanergy, the iHub, and Ushahidi decided to pool their resources and pitch the idea of turning Gearbox into a fully equipped, professionally managed makerspace, providing advanced design and prototyping capacity to Nairobi’s entire hardware entrepreneurship community. In mid-2014, the Lemelson Foundation and USAID each awarded $90,000 to hire an executive director and conduct a viability study of a makerspace in Nairobi dedicated to helping hardware entrepreneurs serving the needs of Kenya’s poor. The plan was to survey the needs of Kenya’s hardware ecosystem, develop a sustainability model, and raise sufficient capital to build a 20,000 sq. ft. or larger, fully equipped, professionally managed space -- about $5 million USD to cover facilities, equipment, and operating expenses for five years, long enough to achieve financial sustainability. Initial funding rolled in quickly, but by March of 2015, the Gearbox team had less than half of the $5M target in hand. With 60% of the budget required for upfront investments in facilities and equipment, the team made the decision to build a smaller facility called Gearbox Lite. The Gearbox team spent nine months renovating and equipping a 2,500 sq. ft. prototyping lab in the same building as the iHub (much of that time was waiting for equipment to ship and clear customs), hiring staff, and developing training materials. Gearbox Lite opened its doors in December 2015 and went on to serve 75 members, 30 contracting clients, 100 trainees, and saw nine prototypes developed over the next year of inventions ranging from an industrial motorcycle trailer to an affordable water filtration unit, a “pay as you go” cooking fuel dispenser, and a cashless payments system for water distribution in informal settlements. In November 2016, the iHub launched its iHub 2.0 initiative and announced that it would be moving to a new facility. Gearbox faced the choice of taking over the iHub’s lease or move, despite not having yet raised the funding required to outfit a 20,000 sq. ft. space of their own. As luck would have it, in January, the team learned of an available space in an ideal location that would require minimal renovation to move in. Gearbox Lite closed its doors in February 2017, and Gearbox Industrial opened to co-located members (members renting private workspace within Gearbox’s facility) in April. By the end of 2017, Gearbox Industrial was host to seven co-located member companies including a mix of international and Kenyan entrepreneurs. Despite being closed for nearly half the year, the Gearbox community still managed to prototype 12 new high-impact inventions ranging from an earthen floor tamping device to a solar-powered “pay as you go” irrigation pump controller, a manual threshing machine for processing teff, and an open-source cellular base station for extending network access to remote locations. While building Gearbox in Kenya, our goal has always been to create a model for supporting hardware entrepreneurship in low and middle income countries that can be adapted and replicated worldwide. We’ve seen firsthand the impact that happens when bright young minds are given the opportunity to turn their ideas into tangible prototypes and launch a business solving the problems they know better than anyone else, and we’re eager to share what we’ve learned along the way. In May 2017, we set up the Gearbox International Foundation to help solve many of the challenges that Gearbox Kenya faced realizing its full potential, and to be a platform to help other leaders of hardware entrepreneurship ecosystems around the world find an easier road than we did. Through our technical, management, and financial support programs, we are working to make powerful tools affordable, accessible, and approachable to entrepreneurs everywhere, so they can keep building things that matter.